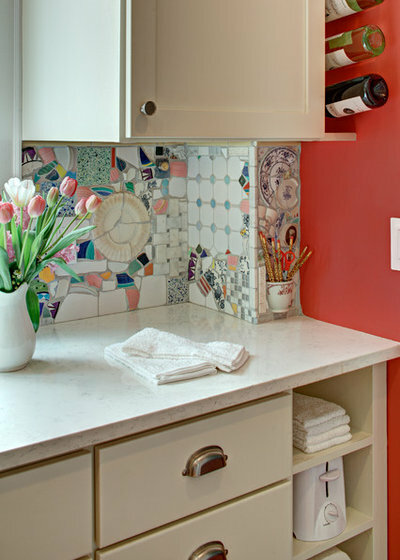 In a recent Houzz story, we expressed the joy of taking risks with color in the home. Creative souls with an aversion to all that is bland and beige drank in the saturated images with enthusiasm, and some even began to wonder what other risks they might take beyond color. 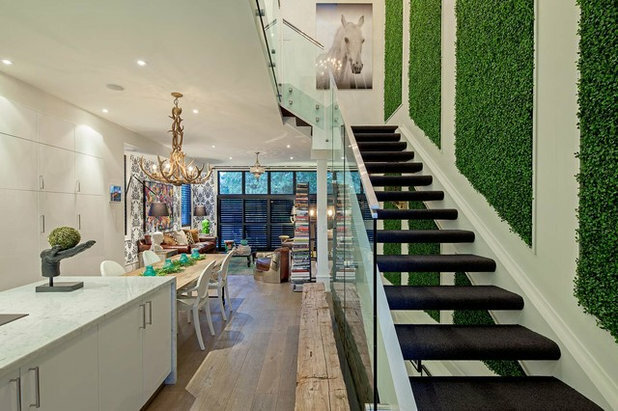 Here are 16 rooms that depict a full range of design risks, from mild to wild. 1. Artistic tile. There is no shortage of unusual tile on the market to create a one-of-a-kind backsplash, but there are artists among us who can scarcely imagine choosing something off a shelf when they could just as easily create a sculpture of found tiles and broken dishes themselves. 2. Sensational skylights. 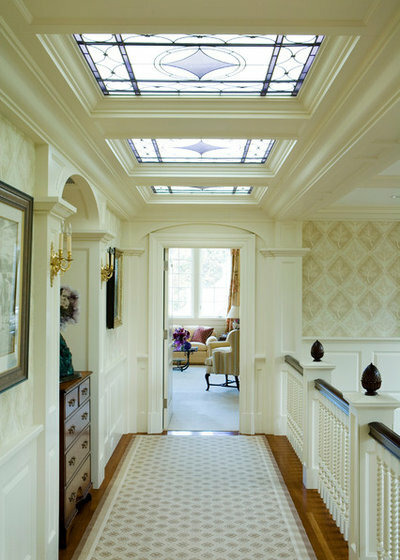 There are skylights, and then there are decorative leaded glass skylights. 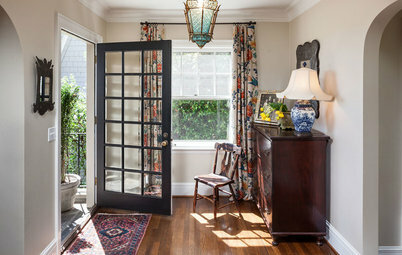 It’s not a look we see every day, which makes it feels like a daring risk with a substantial reward: windows that are unique not only in placement but in material. 3. Bold bath. There are a lot of really good reasons to close off a bathroom that hardly need articulating; a washroom with a door feels more like a common-sense fact than a choice. 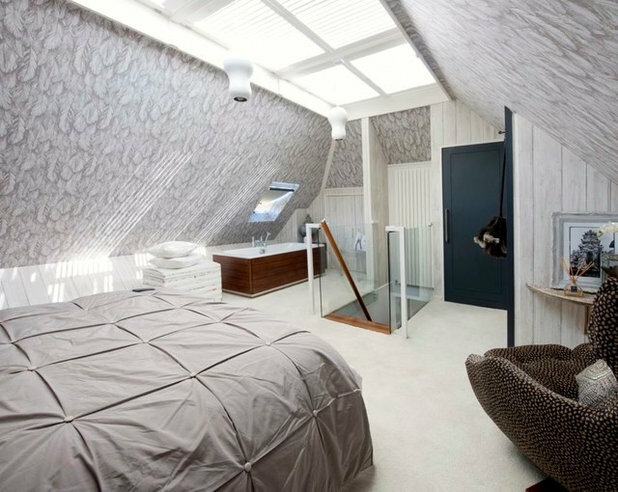 But in a master bedroom suite, leaving at least the shower or tub exposed fosters intimacy and tests our assumptions about privacy and home design. 4. Power of perspective. 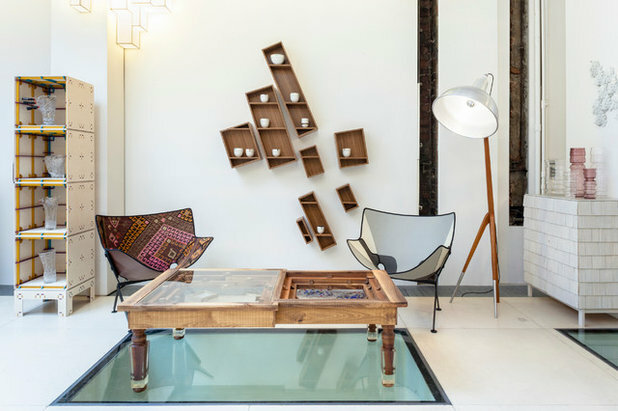 Dare to skew your perspective with slanted wall shelves. They’re perfectly functional, but they’ll keep your guests guessing and pique your curiosity, as they seem at first glance to defy physics. The glass floor inserts add a daring final touch to the space. 5. Window gallery. 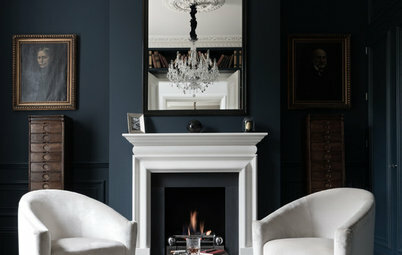 Even in the most traditional spaces, it isn’t uncommon to find paintings and prints mounted on moldings and trim. However, mounting art on windows remains practically unheard-of. 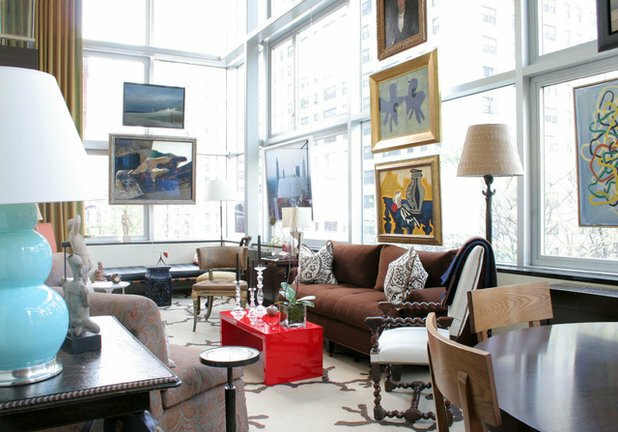 But those willing to take the risk unburden themselves from choosing a paint color to tie their art to the decor, allowing the art itself to become the view. 6. Swinging slumber. What do you get when you put a hanging bed on a porch? An indoor-outdoor bedroom, basically. 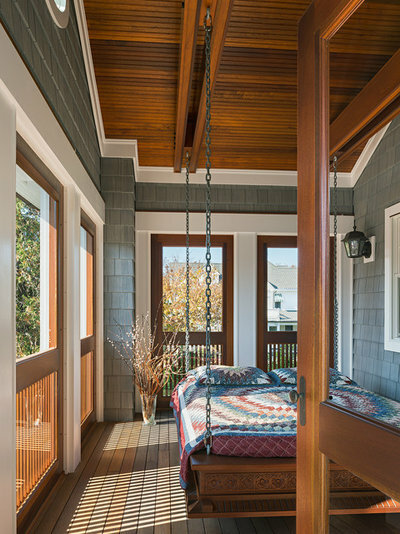 Sleeping porches have been around for ages, but sometimes the biggest “risk” we can take in design is choosing to use our rooms in a way that prioritizes joy and indulgence over practicality and custom. 7. Mirror, mirror. 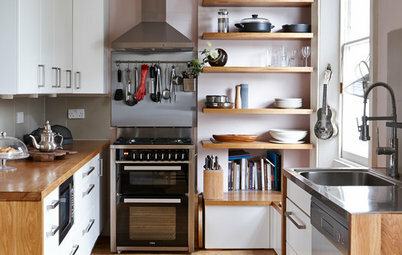 Mirrored cabinet doors represent a relatively minimal design risk, since swapping in more conventional glass at a later date is always possible. 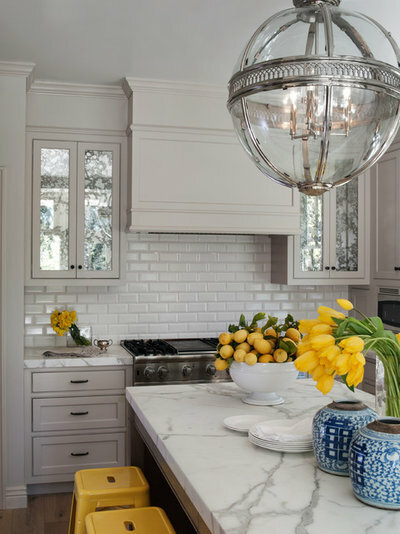 If you’ve always coveted the understated glamour of antiqued mirrors and mirrored furniture, you’d be a great candidate for spiffing up your cabinets in such a graceful, unusual way. 8. Heroic houseplants. When I was growing up, my living room had four life-size palm trees posted in the corners, so when it comes to houseplants, I always go big. 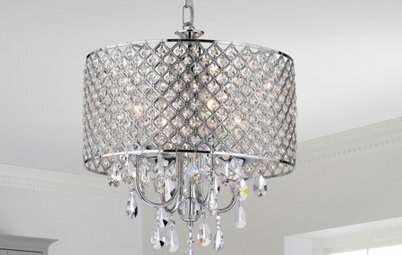 It’s such a simple way to elevate a room, though it’ll raise some eyebrows on awestruck guests. 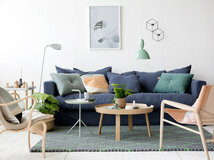 Plants are generally decor-neutral and can go anywhere. 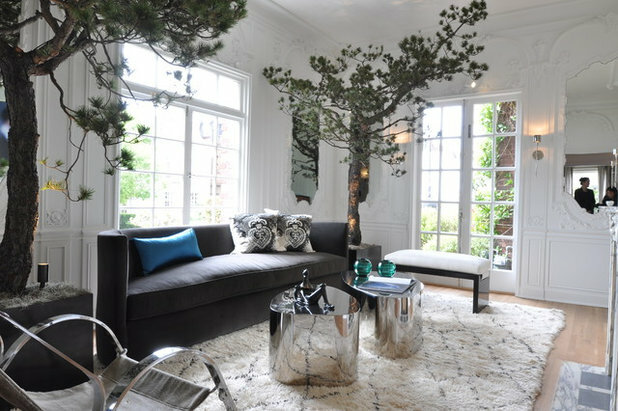 It’s only the scale of the tree that is daring and bold with this look. 9. Natural beauty. Spindly tree branches, glittering stones and a glass staircase paired with warm natural wood are the epitome of an organic modern style that would have made Frank Lloyd Wright proud. 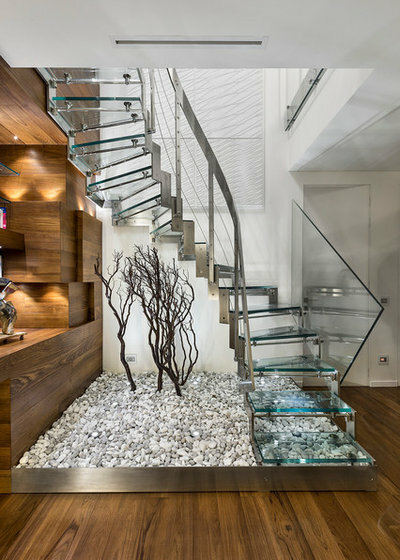 There’s some inherent challenge in mixing sharp, angular materials like glass and steel with softer earthen elements in a way that feels balanced and harmonious, but here, the rocks are the bridge that keeps this bold glass staircase rooted in reality. 10. Pebbled perfection. 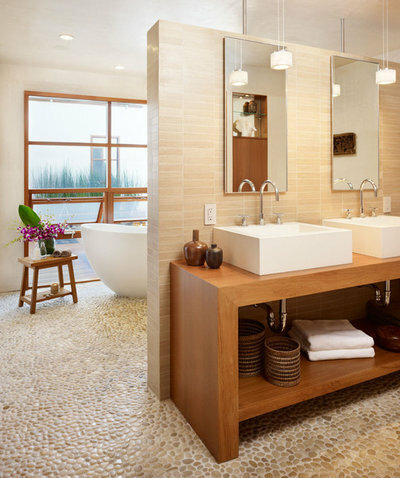 Textured pebble-inspired flooring has become common in shower stalls, but rarely do we see it extended throughout the rest of the room, especially in larger bathrooms. This is unfortunate, though, because it is precisely in larger bathrooms where a dynamic pebble floor can have the most impact, rewarding the bather with the tactile experience of being outdoors on a private patio. 11. Lofty library. Nowhere else, except maybe a staircase, does a glass floor feel more adventurous than on a second-story overlook with a complementary glass railing. Great care must be taken by the engineer and builder to make the promontory safe and secure, but a glass floor will always look like an inspired choice. 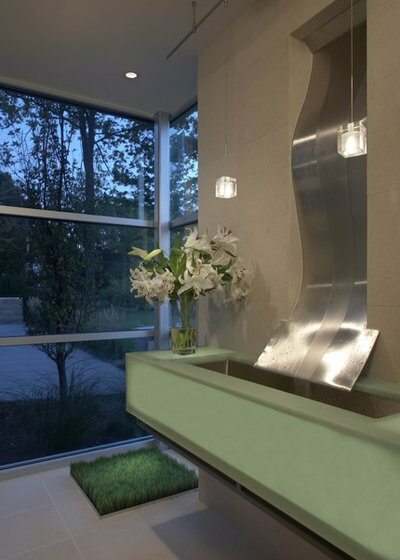 For the more faint of heart, translucent glass tiles or recycled glass bits embedded into a binding material like concrete or resin are less extreme, but still unusual, flooring choices. 13. Avant-garde Astroturf. Using standard materials in nonstandard ways and rethinking the assumptions we take for granted have always been at the heart of progressive art and design. One such assumption is that grass must go on the ground, and outside. This entrenched expectation makes the simple, inexpensive green turf panels hung on the walls here feel like avant-garde art. 14. Mural magic. 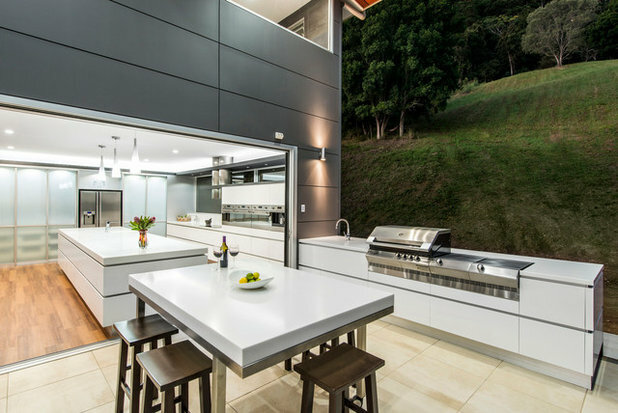 Wallpaper is always a commitment, but hiring a wallpaper company to fabricate a custom mural from a cherished photograph, like this landscape of the home’s hilly site, is an unexpected and modern way to take a leap of faith in creative kitchen design. 15. Pretty partition. 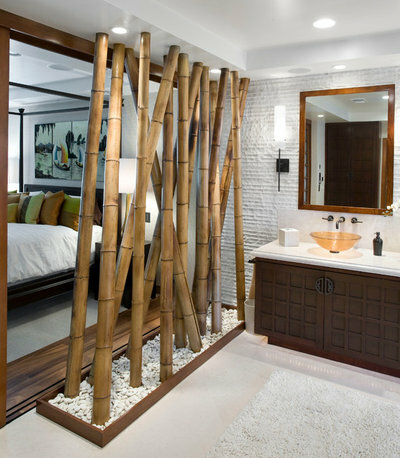 An indoor bamboo thicket partitioning the bedroom from the en suite bathroom merges two exhilarating design risks: the open-concept bathroom and a tropical spin-off of the oversized-tree idea. 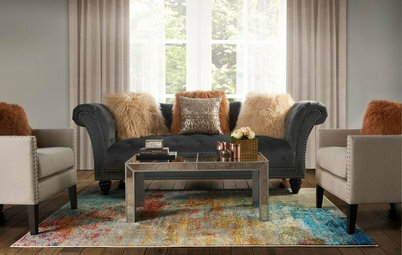 Chic and urbane with an earthy twist, this look could have been lifted straight from the lobby of some ultraluxe Balinese resort. Fortunately for the city slicker or suburbanite, the look is temptingly easy to replicate. 16. Creative columns. 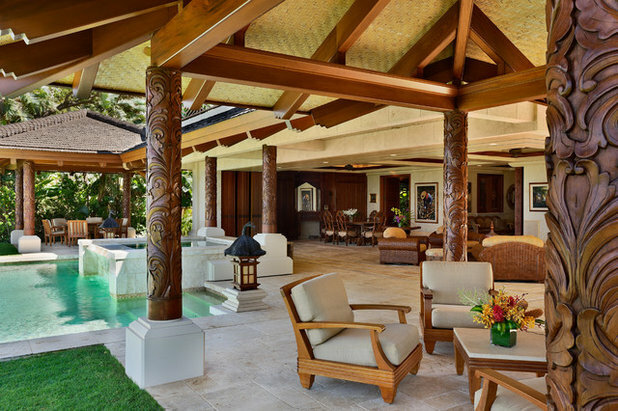 Columns may be an unavoidable feature of covered patios, but there’s no reason they can’t be made into highly original sculptures. Artistry applied to such essential structural elements will always feel risky, because the elements can be altered only at great expense, but carved wood columns will always look custom and will suit the decor as well as uncarved versions. Art paintings on windows... only if you want them with paint-cracks in days. Big NoNo! Some of these risks are a little far fetched for most people's residential spaces, but others are completely do-able! 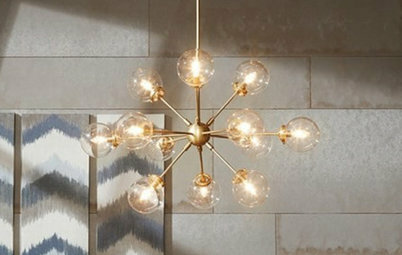 Considering space and budget, some of these risks would be the show stoppers of your home. These are the things that make people walk away saying "Honey, did you see the pebbled floor in their washroom? That was so different!" 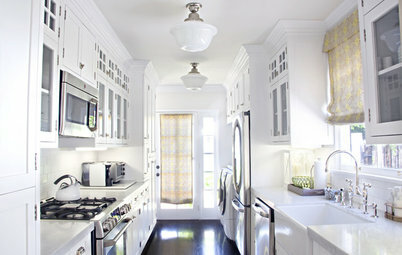 or "Their backsplash was so bold, I wish I was brave enough to choose that!"